This tutorial will show you step by step how to create and verify a YouTube account without using your own phone number but by SMS/Text verification using a free online service. If you verify your account with a phone number you will unlock additional features on YouTube. You might not want to use your own phone number for verification, or maybe you don't have a phone number. Google only allows you to verify two YouTube accounts (channels) per year with your phone number. So if you want to create more than two accounts (channels) then you will have to use another method. Why does YouTube ask for your phone number? YouTube asks for your phone number to verify your identity and to protect their community from spam and abuse. Textfree Web is a free online service that provides people with a phone number that they can use for free calling and texting. This service can also be used to verify all kinds of online accounts, such as Google, YouTube, Gmail, Facebook, Twitter, Tumblr, and more. Note: You will see your phone number at the top right (e.g., (655) 991-4459). You can use this phone number to verify your online account(s). 6. Click on your channel (profile) photo (top right corner) and then click on Settings. Or if you don't see Settings, then click on the gear button next to the Creator Studio button. 7. Click on the View additional features link. 8. Click on Verify located next to your channel (profile) photo. 9. At Select your country, you select United States. 10. Select Text me the verification code. 11. At What is your phone number?, you enter your Textfree phone number. Note: You must enter the phone number exactly as in the example below the field on the YouTube verification page (e.g., (201) 555-5555). An account verification page will open. Don't close this page. 13. Go back to Textfree. 14. Click on the refresh button (two arrows in a circle) to check if you already received the message from YouTube. It may take awhile for the message to arrive. So be patient and click on the button every few minutes. 15. 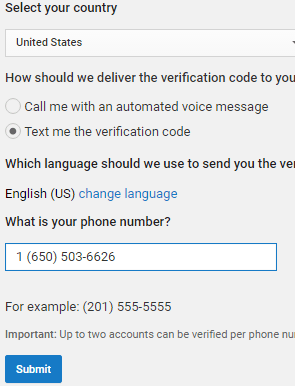 After you receive the text message with the verification code, you will need to go back to the YouTube account verification page. 16. Enter the 6-digit verification code.